You are currently browsing the tag archive for the ‘Zinfandel’ tag. Zinfandel wasn’t out of the question but it had long been forgotten as the easy answer to pairing with burgers. After other varietals that will often show more balance—in terms of alcohol—I’ve been guilty of putting Zinfandel (my first wine romance) on the back burner while seeking obscure wines that would also pair well, until last week, when I had a rare steak dinner—the steak itself being odd, but not rare. 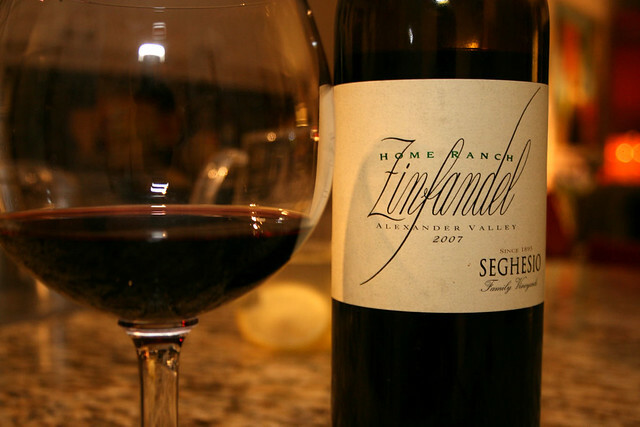 Rummaging through my cellar I found a bottle of 2007 Seghesio “Home Ranch” Zinfandel, cooling comfortably in the depths that was a fitting candidate for that random repast. Six ounces apiece were shared into stems the while dinner materialized. When everything was plated, we cheersed (sic) to an opaque garnet Zinfandel redolent of blackberry and licorice with minor developing notes of leather. On the palate, it had married that opulent black fruit bramble with vanilla and coffee on a marvelously long finish. The Zinfandel packed a Stephen Segal-like punch, swiftly striking with seamlessly integrated HIGH ABV (15.5%), and before I knew it, we were both buzzed. It fit the occasion, taming the beef like a ranch hand. 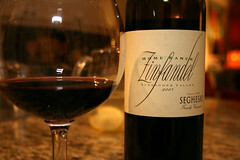 Seghesio was one of the first wineries I fell in love with after spending a lot of time in Sonoma County, and after seeing this bottle of 2007 Home Ranch Zinfandel in action I still see the appeal. Zinfandel is a hedonist’s delight, with its voluptuous body and come-hither ripeness, recalling Peter Paul Rubens’ fleshiness in a beautiful fruit-forward package. I respect Zinfandel immensely and marvel at its ability to knock you on your can while imbibing glass after glass of deliciousness. I kind of fell off the Zinfandel train a few years into wine, preferring subtlety to the overt notes of fruit and tobacco smashing my palate but it is always nice to refresh my memory. 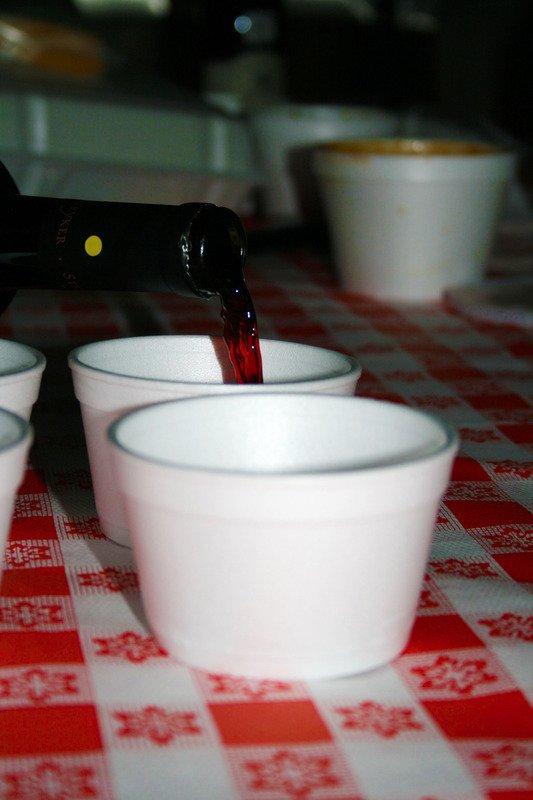 I would still have to exercise caution, remain defensive while attending any Zin tasting—making serious use of the spit cup—to keep my senses alert because the wallop that Zins packs is unforgiving and would make the tasting a drag if I let my guard down. For the coming tasting we met up in West Hollywood; battling traffic (what’s new?) 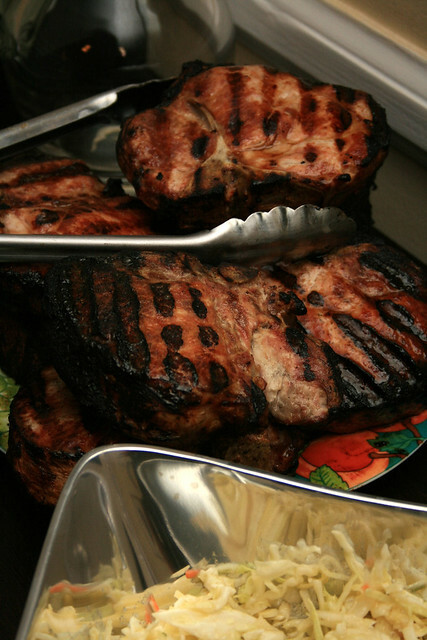 to make it to the tasting that would include a dinner as hearty as the wines of grilled Pork Chops, Momma’s sauerkraut, baked Brussels sprouts, cole slaw and some brownies to wallow in decadence. I was in charge of the tasting order since one of our mainstays (and a big-time organizer) was off in a far away land. I popped the bottles as they trickled in, allowing for maximum breathing time between each of the brawny Zins. I arranged the bottles by amount of alcohol (not by price) from low to high, trying to be fair to those wines with less ABV in hopes that they would have a fair showing in the tasting later on. I was able to open the tasting with a bottle from Lebanon’s major player—Château Musar—and had a bottle of their entry level Cabernet blend. 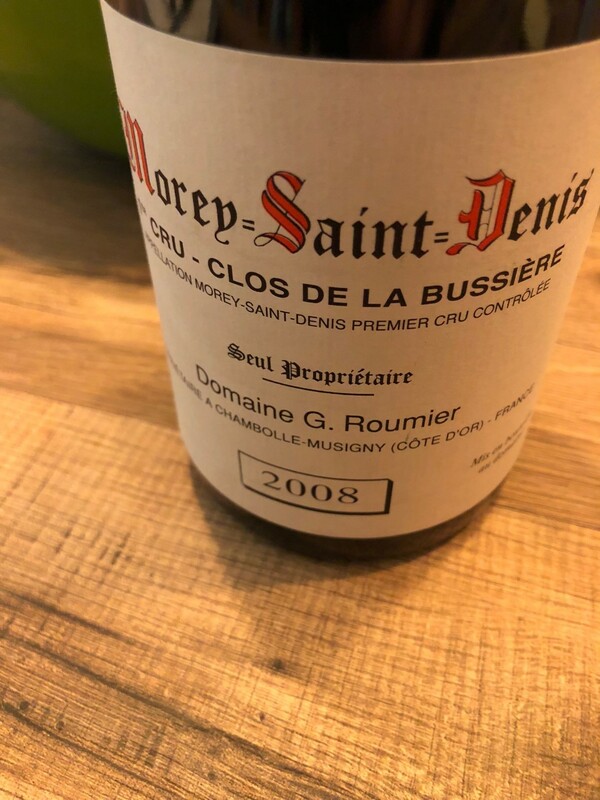 A faint perfume of dried cranberry, herbs and orange blossoms on the nose translated to a little more than Crasins on the palate with drying tannins and moderate acidity. Quickly, we transitioned to the Zinfandels, with the primer in place and moved into the juicy fruit flavors of the Quivira Zinfandel that had a powdered cocoa finish and smooth tannins that perked up my buds. Moving into another crowd pleaser with notes of blackberry, eucalyptus and coffee filling the nostrils, showing a pleasant blue and blackberry combo with velvety tannins and a long favorable finish, the Acorn “Heritage Vines” Zin was a great sipper on its own. Not all the wines were as well received, some (he doesn’t name names) showed a little more than baby fat in the mouth and left our collective palates saturated in grape jelly, still we were getting as much traction as we could coming out of the goopy turn, making tracks to Mauritson. We showed two Mauritson wines back to back, their first Zinfandel shown deep garnet in the glass with notes of ripe cherry and some figs on the nose and following on the palate. The Rockpile Zinfandel showed a detectable difference from its varied soils with some herbs, fruit and potpourri that leaped from the glass and on the palate everything was balanced but big with ripe cherry, tobacco and wood spice lingering on the finish. We concluded the tasting with the two Seghesio wines, side by side. The blue labeled Zin had garnet coloring with red fruits, smoke and oak on the nose. 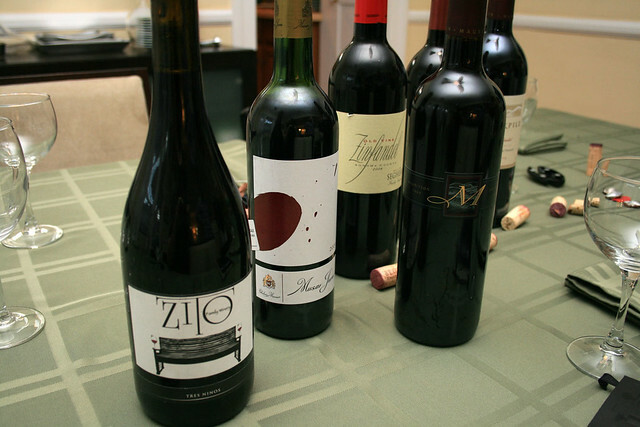 The dry wine was surprisingly herbaceous and we then tasted the “Old Vines” Zinfandel that had potent aromas of red fruits, licorice and boysenberry that was coupled with intense acidity by comparison, in addition to the enjoyable amount of fruit. It was the first time in the night I had paid attention to acidity which to me spoke volumes. We were ready to eat, devouring a summer night’s fare that complimented the wines remarkably. The sides of Brussels sprouts with fresh thyme mixed well with some of the earthier Zins present and the Sauerkraut was one of my favorite items eaten this year and could easily have been eaten on its own. I knocked off nine wines during this sumptuous tasting, leaving 182 left on the journey and I can assure you that Zinfandel will be making another visit on the countdown. In Compton—a city, cloaked in unnecessary falsehoods and wild ideas of a rough landscape—there is an over-achiever, when it comes to barbecue. Bludso’s sits on South Long Beach Blvd, providing the hole-in-the-wall- atmosphere synonymous with “good eats.” I recently amassed a group of twelve (members of the Better Burger Bureau) to get some take out with wine, meanwhile introducing a few people to the fine smoked meats and heavenly sauces made to taste from Bludso’s. Despite the restaurant’s petite frame, the production is colossal; two massive smokers in the back are forcing connective tissue and other tough meats into a tender submission, nearly all day. As a result, they have a deep menu. With a group as large as ours, we simplify ordering—placing them in groups (divisible by factors of three)—by choosing the “Texas Sampler” for an affordable twenty-eight dollars, per group. 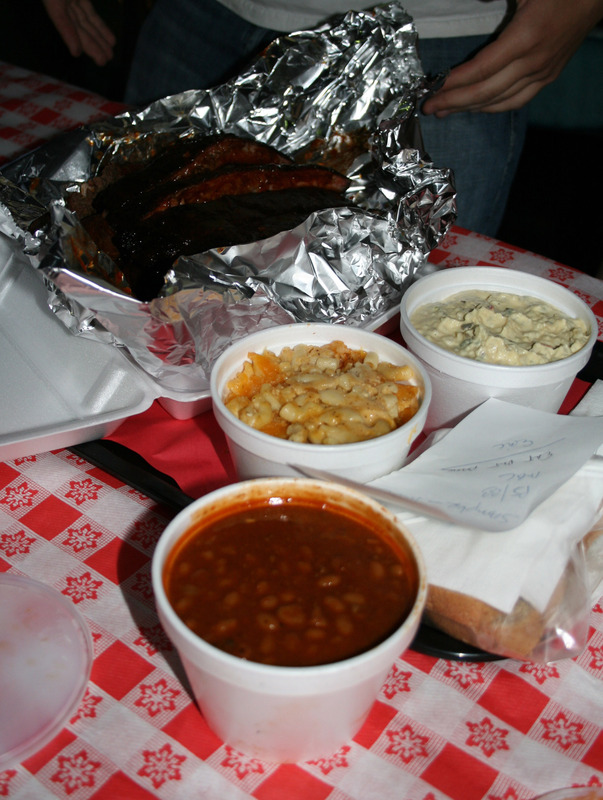 * The sampler provides two sides, and a large smattering of meats: ribs, rib tips, chicken, hotlinks (two varieties) and brisket. It covers all bases and like the name implies, it is a great way to acquaint one’s palate with the house style of BBQ. Bludso’s is keen on service too, amiable and very accommodating—I often come with bigger groups than can be supported at the four seat bar—they also sweeten the deal by adding in a free side or throwing in a drink of water. The ribs are first to go, crowned on top of the piled-high plate of meats and poultry, which must be parceled out to get to the other items of the sampler. It is a generous portion, roughly five to six pounds, insulated by aluminum foil. The glazed ribs voluntarily separate from the bone. The hotlinks have a nice kick (mildly piquant), a little crunch from the casing, and a coarse texture that makes them satisfying but not for everyone. The chicken, from breast to legs was smothered in rich sauce and still maintained moisture in the white meat, which can be notorious for its dryness. The ultimate food item in the sampler was the brisket, buried under the other items on the plate. The brisket was fatty (in the best way) and melted on your tongue, with sweet and smoky flavors adding complexity. Truly, saving the best for last. We paired the samplers offerings with California zinfandels: Blackstone, Stryker Kights Valley 04 and one French import: Cote-du-Rhone from Domaine Charvin 07. 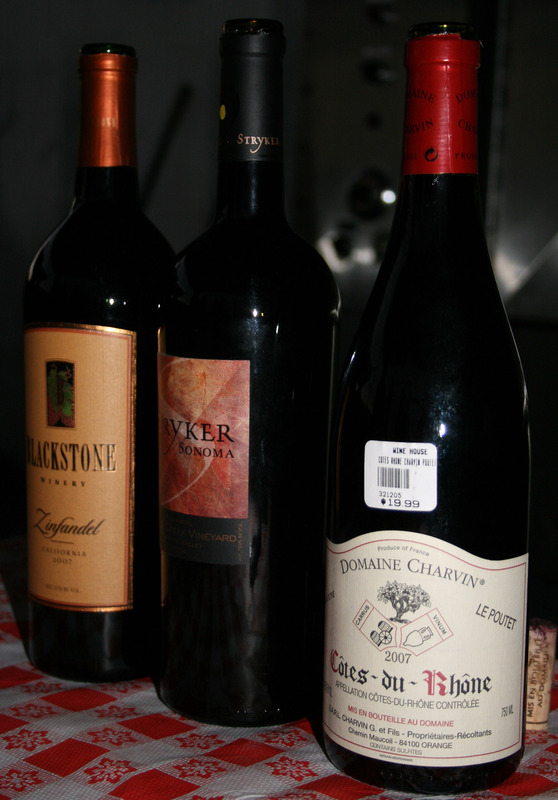 The pairings yielded typical results—Charvin stood up perfectly to the rich sauce. Domaine Charvin exhibited the largest backbone (significant structure), a big full feeling across the palate and was coupled with an intense bouquet of black fruit and pepper. The zinfandels were both enjoyable but unfortunately could not support the weight of the food and the richness present in the sauce. While Compton is not filled with poodles or kids skipping on street corners, it is not deserving of it rough and rumble reputation, at least not where food is concerned. Instead, Compton represents a value in food and it also houses a barbecuing lodestar. Bludso’s consistency and service are unparalleled in Southern California and I cannot wait to return. * I alluded to it already, but the value in food (amount and price) cannot be rivaled. Approximately $31.00 for that much food will double at another eatery, and while I am not a fan of just going for cheap eats, the food is of high quality and worth seeking out. A Dutch dinner is simple and tasty, consisting of potatoes, meats and often sharing the plate with another vegetable—at least these are my experiences. Although the meal lacks complexity, it warms the stomach (especially important when the weather in the country is extremely cold) and banks on the savory and rich elements from great butters and extremely fresh ingredients. Fresh off a trip from Holland, I was eager to replicate the fare with my Mom and share the experiences at the family table. On the menu were pork chops, fingerling potatoes, corn and a salad. 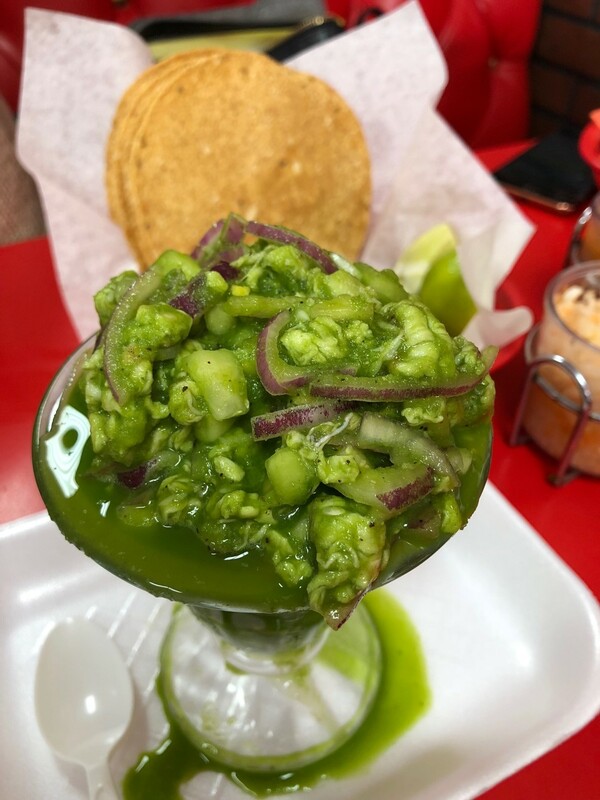 We had to make some concessions to the state of California by incorporating greens and avocados into the salad (since a typical Dutch salad may be without those). With the acknowledgement of California it opened the window to pairing the meal with a California Zinfandel because much to my chagrin the Dutch are not amazing winemakers. Mauritson Family Zinfandel (2007) was the wine of choice for the night’s dinner. The nose was redolent and the flavors were soft and balanced. I tasted some wild berry and some sage with the signature pepper finish. It paired well with the meal bringing out the richness of the chops while being soft enough to mix with the salad. 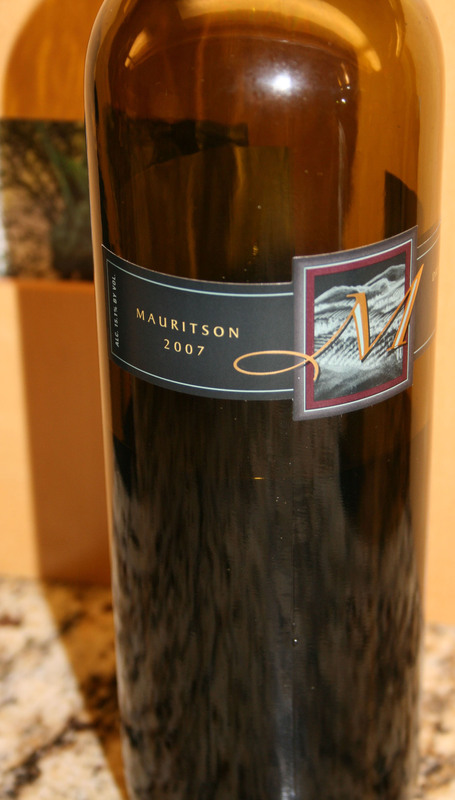 Mauritson Family Winery is another stellar winery from one of my favorite wine regions… Sonoma County. Located in Dry Creek, this winery produces amazing zinfandels and is most well known for their Rock Pile wine (an AVA that has complex soil composition, at its higher elevation, produces unique wines). The Dutch dinner and the California wine were in complete harmony throughout the night. After finishing the bottle with parents and friends I was relieved to know there was a case in the cellar for me to enjoy in the future since two glasses were not enough.